A very different kind of salad, but a very good one! With just a few simple ingredients and about 10 minutes of your time, you will have a wonderful, uniquely flavored starter dish that leaves you craving more. Fresh lemon juice, fresh chopped mint, sugar, and olive oil provide a delicious almost candy-like sweetness and tanginess. 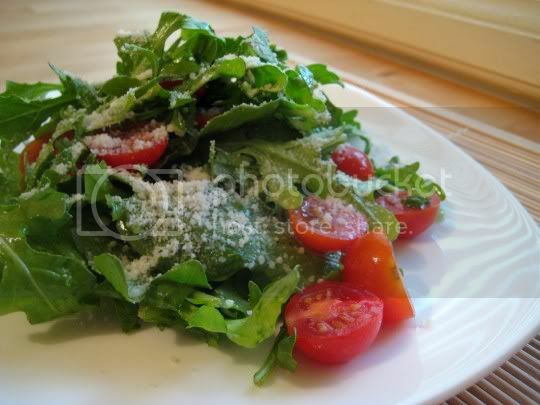 It coats each bitter leaf of arugula, creating a very nice flavor contrast, while cherry tomatoes add more sweet and tangy juiciness. The fresh mint goes well with the lemon, and although I'm not a huge mint fan, it doesn't overpower any of the other flavors and adds an extra herbal element with the arugula. The recipe calls for shaved Romano curls to top the salad, but since I already had a tub of grated Romano (and didn't want to spend $6 a pound for a wedge of it), I just sprinkled it on top. Either way, the cheese will add the saltiness and savoriness that the salad needs. Make again? Definitely. Croutons would add some nice texture for the next time. Greetingws from NYC...I'm sitting at the computer looking at your wonderful blog, with your Mom, Dad, Aunt Cheryl, and your cousin Ben all around me. Well, I must say, I'm sooo impressed! Everything sounds and looks delicious. What a great idea for a blog! Congratulations on putting this together!